The U.S. highway transportation system is called the backbone of America because the Nation’s economic future depends on its ability to efficiently and safely move people and goods across the country. U.S. transportation agencies are challenged to make the system more efficient using existing infrastructure and funding resources, while improving travel times and safety. The goal of transportation research is to develop solutions to the Nation’s most pressing challenges and find transformative opportunities that will meet future needs. This FHWA 2015 R&T Story presents some of the national highway transportation challenges, and discusses how the research and innovations conducted or sponsored by FHWA address these challenges and contribute to changes and improvements in the transportation system. This document also highlights a variety of research projects and activities that demonstrate FHWA’s positive and long-lasting impact on the national highway transportation system. 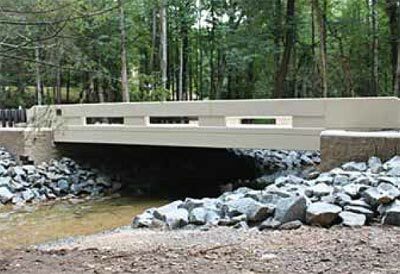 FHWA developed geosynthetic reinforced soil-integrated bridge system (GRS-IBS) technology. This accelerated bridge construction method for bridges saved State DOTs millions of dollars (15 to 60 percent in construction and design costs) and significantly reduced construction time—thereby minimizing construction zone closures and inconvenience to drivers. FHWA investigated “Safety EdgeSM” technology to determine whether tapering the edge of a road would help drivers to navigate back on the road. According to the 3-year crash analysis, the benefits outweighed the costs by as much as 63 to 1. Most importantly, Safety Edge can contribute to saving lives by reducing the potential for rollovers and other severe crashes. Brought to the U.S. by FHWA, use of warm- instead of hot-mix asphalt reduces fuel consumption, greenhouse gas emissions, and paving costs, while extending the paving season and potentially improving compaction. To date, 41 State DOTs and all Federal Lands Highway divisions have specifications for using warm-mix asphalt. In 2013, warm-mix asphalt is estimated to have reduced emissions by 2 million tons (the equivalent of removing 200 thousand vehicles off the roads). And to expand on the environmental benefits, FHWA is conducting additional research to develop well-founded guidance for using warm-mix asphalt in combination with a high content of recycled materials, such as reclaimed asphalt pavement, to achieve durable pavements. FHWA’s research provided the details for connecting Prefabricated Bridge Elements and Systems and knowledge on Slide-in Bridge Construction to enable State DOTs to shorten the time needed for work zones and road closures. FHWA transitioned a good idea into a great idea by furthering the development of the diverging diamond interchange (DDI), a new method of navigating through busy highway intersections, which improves safety for motorists and pedestrians at highway interchanges while reducing congestion. FHWA developed a Project Finance Primer to help agencies compare various approaches to planning and delivering expensive construction projects, such as evaluating the difference between funding projects through conventional design-bid-build projects or using public-private partnerships. Migma Systems developed a new stereovision-based approach for detecting pedestrians at intersections. Based on a concept borrowed from military tracking, the company used a new light-emitting diode (LED) stereo camera and advanced pedestrian-detection algorithms to distinguish pedestrians and vehicles on the roadways. Information from the project can be used in connected-vehicle research to greatly reduce pedestrian fatalities. Solar Roadways envisions replacing current asphalt or concrete surfaces with modular solar road panels: structurally engineered solar panels that replace conventional paving on roadways. The intent of the research is to demonstrate the potential for developing structural pavement panels that can convert solar radiation to electricity and disseminate the power to meet local electricity demands. The full impact of transportation research and innovations is usually realized over years or decades as the products are implemented across the transportation system and advance the state of the practice. Research results, when implemented appropriately, can save millions of dollars, save lives, extend the life of highway infrastructure, reduce congestion, improve travel time, increase productivity, and positively affect the environment. FHWA’s research, guidance, and efforts provide State DOTs and local agencies with the leadership and support needed to address new and shifting challenges. Within FHWA, hundreds of research projects are underway to develop innovations and solve the country’s pressing transportation problems. Because transportation comprises many disciplines, from human factors to structural engineering to environmental and safety planning and engineering, an extensive depth and breadth of knowledge is necessary to address the challenges facing our transportation system. The FHWA R&T Agenda was developed to communicate a comprehensive plan for the Agency. The plan provides a collaborative platform to address national transportation challenges and transparency into research activities. Stakeholder input also enables a deeper understanding of the challenges and issues at the local and State levels. Advancing Safety Toward Zero Deaths—a highway system free of fatalities. Improving the Mobility of People and Goods—moving people and goods, reliably and safely, to where they need to go. Preserving the Nation’s Infrastructure—keeping pavements, bridges, and structures in good condition. Enhancing System Performance—decreasing highway congestion, safety risks, and wear-and-tear on roadways. Promoting Environmental Sustainability—improving public health, enhancing the environment, and conserving natural resources. Preparing for the Future—transforming big ideas into the innovations of tomorrow. Addressing these six challenges requires the cooperation and collaboration of numerous stakeholders in the public and private sectors, academia, industry, and the international community. FHWA has developed partnerships with many of these stakeholders, offering a way for transportation stakeholders to become involved with and contribute to developing a stronger transportation network. The remainder of this FHWA 2015 R&T Story highlights six key challenges facing the Nation’s transportation network, and demonstrates how FHWA R&T solutions advance the Nation’s mobility, well-being, and economic security. FHWA’s Turner-Fairbank Highway Research Center (TFHRC) in McLean, VA, plays a vital leadership role in developing and implementing coordinated highway R&T with other research entities within the U.S. and internationally. TFHRC houses more than 20 laboratories, data centers, and support facilities; and conducts and sponsors applied and exploratory advanced research on vehicle-highway interaction, nanotechnology, safety, pavements, bridges and other highway structures, human-centered systems, operations and intelligent transportation systems (ITS), and materials. Researchers and engineers with expertise in a variety of disciplines (e.g., engineering, chemistry, and psychology) support TFHRC’s mission. TFHRC not only delivers cutting-edge in-house research, but also collaborates with a wide range of researchers across the Nation and around the world. The center’s laboratories provide FHWA, the U.S. Department of Transportation (USDOT) modal agencies, other Federal agencies, and State DOTs and local agencies with vital resources for advancing the body of transportation knowledge. TFHRC actively engages in formal collaborations with the American Association of State Highway and Transportation Officials (AASHTO), the Transportation Research Board (TRB), and the Forum of European National Highway Research Laboratories. In addition, there are informal collaborations with researchers in U.S. companies, academia, and other federal and local agencies, resulting in joint peer-reviewed papers and shared research methods. TFHRC also engages in cooperative research and development (R&D) agreements with the private sector and academia to explore and build new highway-related technologies. To work on projects of mutual interest, TFHRC hosts visiting researchers from a variety of organizations. Through the National Research Council Research Associateship Program, TFHRC sponsors postdoctoral and senior research associates who work closely with center staff on research that is relevant to FHWA’s challenges and contributes to the associates’ professional development. The program attracts skilled associates at the cutting edge in their disciplines, and allows FHWA to focus associates’ talents on significant problems. Many associates continue working in transportation research and contribute to the Agency’s research after finishing the program. With TFHRC providing research, development, and technology management, the FHWA R&T Agenda articulates the objectives that guide the Agency’s research, development, and deployment activities to strengthen and improve the National Highway System. The FHWA 2015 R&T Story also identifies the strategies that FHWA is pursuing to achieve those objectives, and selected activities that target one or more of the Nation’s six key highway challenges. Take a look at the following research highlights that contribute to enhancing and improving the national transportation system. In 2009, FHWA launched Every Day Counts (EDC) in cooperation with the AASHTO to speed up the delivery of highway projects and to address the challenges presented by limited budgets. EDC is a State-based model to identify and rapidly deploy proven but underutilized innovations to shorten the project delivery process, enhance roadway safety, reduce congestion and improve environmental sustainability. A key component of implementing new technology is nurturing a State-based network for the deployment of innovation. To support this concept the FHWA established the State Transportation Innovation Council (STIC) Incentive Program and the Demonstration Project Program to help States institutionalize innovations and meet their innovation deployment goals. The following Web sites provide additional information and further highlight the transportation challenges and FHWA activities discussed above. Geosynthetic Reinforced Soil Integrated Bridge System, Synthesis Report: https://www.fhwa.dot.gov/publications/research/infrastructure/structures/11027/11027.pdf. Warm Mix Asphalt Technologies and Research: https://www.fhwa.dot.gov/pavement/asphalt/wma.cfm. Prefabricated Bridge Elements: https://www.fhwa.dot.gov/everydaycounts/technology/bridges/intro.cfm. Diverging Diamond Interchange FHWA YouTube video: https://www.youtube.com/watch?v=eLAwwl3EtN4. Small Business Innovation Research (SBIR): http://www.volpe.dot.gov/work-with-us/small-business-innovation-research. AP Story—Inventor Pushes Solar Panels for Roads, Highways: http://bigstory.ap.org/article/inventor-pushes-solar-panelsroads-highways. 2 Transportation Research Board (2008). TRB Special Report 295, The Federal Investment in Highway Research, 2006–2009: Strengths and Weaknesses. Transportation Research Board, Washington, DC.